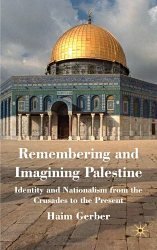 Remembering and Imagining Palestine: Identity and Nationalism from the Crusades to the Present, by Haim Gerber. Remembering and Imagining Palestine sets out to explore the history of Palestinian nationalism and identity, an identity which stretches back to the time of the Crusades and beyond. In those days it was an identity whose character was more social than political; two of its most significant elements were the community of fear which coalesced around the possible return of the Crusades, and the use of ‘Palestine’ as the name of the country. The nature of this traditional identity came to exert a strong influence on the emergence of Palestinian nationalism following the fall of the Ottoman Empire. As time progressed, the mixture of old memories and new imaginings created amongst the Palestinians a sense of preordained ethnic responsibility: they became conscious that they were elected by God to serve as guards of the holy sites of Jerusalem for the entire world of Islam. This book demonstrates that this idea became the main driving force of Palestinian nationalism and, indeed, remains so to the present day.